Unusual Historicals: Greatest Hits: Get Out the Wash Board! Greatest Hits: Get Out the Wash Board! The domestic arts were essential for keeping a decent house in Colonial America. Even so, men gave little regard to women's chores, offering a third or fourth less wages for domestic help compared to a man's wages for agricultural labor. 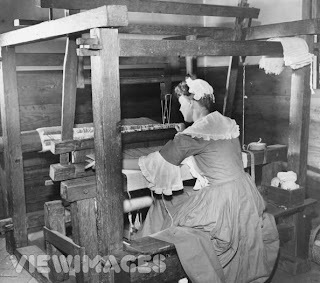 The majority of Americans clothed themselves in homemade woolens, linen, and "towcloth" made from flax. Daughters often took the task of spinning, and unmarried women of the household, hence the term 'spinster'. Once the thread was ready, it was usually taken to a weaver in the village in exchange for goods or labor. Weaving wasn't as widespread as spinning, and not ever household had a hand loom. The cloth had to be cut and sewn into garments. Skill with a needle and thread, and sewing, were synonymous with womanhood. The process of making butter and cheese still had a mysterious air about it. This attitude lingered from the witch hunt days, when trouble with cattle and milk was enough to accuse a woman of witchcraft. While women were safe from the pyre for curling milk, the process remained a magical transformation. In a corner of the kitchen, shed, or springhouse, women churned milk into butter and cheese without worries. Butter took over an hour to churn, and then it was kneaded and pressed into solid consistency. A talented dairywoman could make good money by packing her flavorful butter into tubs or crocks, marking it with a distinctive butter stamp, and selling it or trading it for goods. Cheese-making was more widespread north of Pennsylvania and also provided a decent trade for women. Can you image lifting heavy iron pots to set on the hearth, or hooking it to a crane which swung over the fire? This visual is enough to make my back hurt! The quantity of kitchen equipment depended on the family's wealth. If you were lucky to be affluent, you'd have various pots and kettles, gridirons and toasting forks, and a large fireplace oven. If not, often bread was baked in ashes and there'd only be one pot to cook in. I'm doing a load of laundry as I type this post, and usually, I complain about having to wash clothes. Spoiled me! Back then, women rose before sunrise to begin their washing day. In the morning, they scrubbed and pounded their clothes in tubs of near-boiling water and homemade soft soap - washing, rinsing and repeating the cycle. In the afternoon, the washed clothes were spread out to dry. The Industrial Revolution was about to change the lives of women by providing convenient appliances to shorten her work load.